The Orange Bowl has been set now for nearly a month. Both teams are acclimated to the Miami weather and coming off a loss. One streak will end. The Big Ten runner-up Wisconsin Badgers visiting Atlantic Coastal Conference runner-up the Miami Hurricanes. Hurricanes get the benefit of being at home and is playing in the Orange Bowl for the first time since the 2003 season. Badgers are playing in their 16th consecutive bowl game, the longest streak in the Big Ten. Hurricanes headed south since back-to-back nationwide attention wins over Virginia Tech and Notre Dame. The Badgers needed a win over the Ohio State Buckeyes to solidify a spot in the college football playoffs however they would have most likely have the underdog term stamped on their jerseys. The game will possibly showcase the best defensive battle of the new year six bowl games. Let’s get into the teams with a prediction. The Badgers are very impressive. Their one loss can be put up for an argument in playing in the college football playoffs however when you begin at the quarterback position the question posed is how did they lose only one game? Alex Hornibrook who despite throwing 15 interceptions which were among the highest total in the country had his team smelling the college football playoffs. In the Big Ten title game facing the Buckeyes, Badgers recorded a season-low 60 rushing yards on 32 attempts. 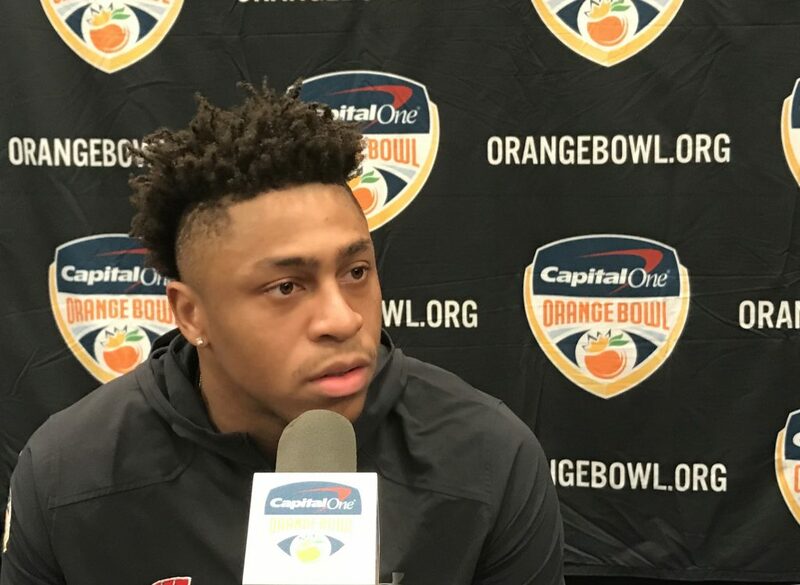 Tailback Jonathan Taylor was limited to 15 carries for a season-low 41 yards; Hornibrook attempted a season-high 40 passes, and the offense didn’t make enough plays to help UW win a title and secure a playoff berth. Taylor rushed for 1,847 yards this fall, the fourth-highest total of any FBS running back in 2017. If he picks up another 79 (about half of his average) against Miami on Dec. 30 in the Orange Bowl, he’ll break Adrian Peterson’s FBS freshman rushing record. Taylor turned down college offers from Yale and Harvard before choosing Wisconsin. “I definitely gave them much consideration; I visited Harvard three times. That was a big school on my radar. It was tough, but I am glad to be here with my boys,” Taylor stated. “One of the deciding factors was where do I want my college experience. Harvard has great academics, have some good football. Here I have a great balance between academics and great football. Taylor is the factor to complement the Wisconsin defense with Hornibrook managing the game. Quarterback Malik Rosier made his future the last two games of the regular season with losses to Pittsburg and Clemson in the ACC title game. Rosier did everything the coaches could have asked for this year. He is a streaky passer, illustrated by his completion rate of 54.8%. However, he averages 243.1 passing yards per game, has 25 touchdown passes and has rushed for five touchdowns. In the first-ever early signing day the Hurricanes signed 19 players out of their 20 player class in the first early signing day and are ranked 6th in the nation, final numbers will come out in the second signing day in February. Taking advantage of the successful season on the field and success of the popular turnover chain. Rosier’s starting position will be on the line in the fall. The defense has been consistent all season long. They hit a roadblock facing he Clemson Tigers the break before this game comes at a valuable time. Miami has recorded 30 takeaways this season – 17 interceptions and 13 fumble recoveries. The Hurricanes have forced 22 of those turnovers – 13 interceptions and nine fumble recoveries – in the last seven games. The player responsible for a turnover is given the team’s “turnover chain” on the sideline after making the play. Sixteen players have donned the chain this season. The most prominent story of the year is the turnover chain in South Florida. Miami’s No. 1 target likely will be Hornibrook, who has 15 interceptions this season. The Orange Bowl will be the fifth meeting between the programs and second in a bowl game.UW and Miami met in the 2009 Champs Sports Bowl in Orlando, and the 24th-ranked Badgers pulled off a 20-14 victory over the 14th-ranked Hurricanes. Seniors on both teams get one last shot. Wisconsin is a 6 ½ point favorite on the Hurricanes home field. Hurricane Irma forced Miami to adjust its schedule, and the Hurricanes played in each of the final 11 weeks of the season. That wear and tear, as well as injuries to key players, took a toll as the Hurricanes lost their last two games. Miami’s players insist they are rejuvenated, motivated and ready to cap the season by upsetting UW. The Badgers are determined to play better than they did against Ohio State in the Big Ten title game. UW will play better on both sides of the ball and finish the season with a historic 13th victory, 21-17.